Although census data show Oregon’s population becoming more racially diverse, the perception persists that we are one of the whitest states in the nation. Many Oregonians value racial diversity and the dimension and depth it adds to our lives, yet we remain largely isolated from one another and have yet to fulfill the vision of a racially integrated society. What systems are in place to prevent the racial integration and equity many of us strive for? Knowing what we do, how do we act—as individuals and communities—to embrace the opportunity presented by a more diverse Oregon? This is the focus of “Power, Privilege, and Racial Diversity in Oregon,” a free conversation with Willamette University professor Emily Drew on Thursday, October 26th at 10 am at SEUL 3534 SE Main St Portland, OR 97214. 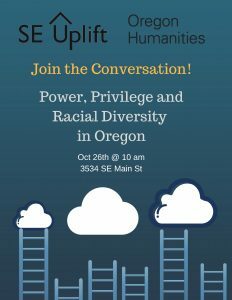 This program is hosted by SE Uplift and sponsored by Oregon Humanities. Through the Conversation Project, Oregon Humanities offers free programs that engage community members in thoughtful, challenging conversations about ideas critical to our daily lives and our state’s future. For more information about free this community discussion, please contact Muz Afzal at (503)232-0010 ext 319 or muz@seuplift.org. 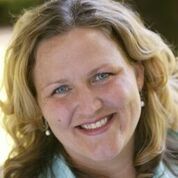 Drew is an associate professor of sociology at Willamette University, where she teaches courses on racism, race and ethnicity, urban sociology, mass media, and social change. She earned her doctorate from Loyola University Chicago and has published articles in Critical Studies in Media Communication, Television & New Media, and Tourism & Cultural Change.